Lee Child is the best-selling suspense writer who reliably publishes a new Jack Reacher novel every year. If you haven’t made the acquaintance of Jack Reacher yet, what are you waiting for? He’s one of the most memorable thriller heroes being written today. Tough as nails is a cliche, and it doesn’t come close to describing Reacher. The last thing you ever want to do is cross Reacher. You won’t be alive to make the same mistake twice. 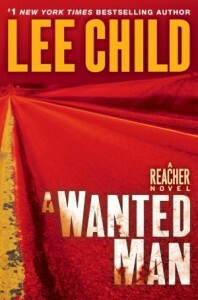 Child’s latest Reacher novel A WANTED MAN will be published in September 2012. Here’s a Lee Child interview from August 2009 that’s worth listening to. Check out the Reading and Writing podcast for 70+ interviews with many writers and authors discussing their books, the writing habits, and what they’re reading and enjoying.